Wordless story about a man who awakes in his bed wearing his clothes (including a check vest). He rises, washes his face, combs his hair, and heads for work across the street at a copy shop. He inadvertently makes a photocopy of his hand, and then the machine beings turning out copies of photographs of himself, the street outside, and his apartment. He unplugs the copier and heads home. He repeats the scene we saw earlier. Copies of himself emerge from bed, baffled, he watches them go to work. Soon, it seems, he's part of a society in which everyone looks like him and wears check vest. Can he get things back to normal? A man awakens and goes to his job at the copy shop. During his morning test of the machine, he accidentally copies his hand, while he's looking at that copy, the machine starts churning out scenes from earlier that morning. Spooked by this, he closes up early and goes home. Soon, he starts seeing copies of himself in more and more places. One of the best short movies ever! A very clever idea! I've never seen any Austrian movie before and I would have thanked God to have made me tape this short movie if I believed in God!!! 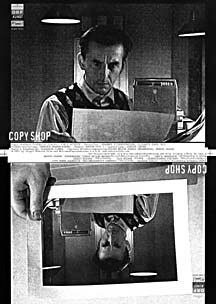 This is an excellent experimental movie which develops a very interesting idea and clever new technics which consist in animating photocopies of pictures. Moreover Virgil Widrich wrote the right story to stick with the technics. And the result is amazing: the aesthetics are very good and the special effects well-done. But it's not all: Zlamal's music is very moving and Johannes Silberschneider performs his several roles with majesty! At the end I felt very strange and wondered a lot of things but above all I thought about problems of cloning humans! Generally I thought about the dangers of homogeneity: can we become all fools?... But I won't tell you more because suspense is so important in cinema!